As you enter Eclipse casino website you know you’re in for something special. The home page is a work of art, unparalleled by most casinos – you better go and check it out for yourself. The excellent user interface makes it easy to locate any game you are looking for, and the search bar is certainly a huge help. The website is offered in both English and French and there is 24/7 live chat support available. Being among the gambling sites that accept PayPal deposit, Eclipse Casino has quickly become a highly entertaining and reputable PayPal casino online. It was established by Blue Media N.V. Casinos in 2017 and is licensed and regulated by the Government of Curacao. Eclipse Casino considers providing the most secure and fair casino gambling experience as its mission and it caters to players all around the world. The following Eclipse casino review will help you decide whether this casino is worth your time if you’re still on the fence about it. The deposits can be of any amount and there is no maximum cash-out set for these bonuses. Aside from the welcoming promotions, there are monthly rewards at Eclipse Casino. Those let you get up to 250% match bonuses for either slots or cards with the codes like LUNARAY250 or SOLARAY150. Finally, by being a member of the VIP Club (which is automatic as soon as you play your first real money game) you are in for loyalty points, special promotions and exclusive offers. Eclipse Online Casino features around two hundred games from a large and well-known software provider, Rival. The manufacturer has a reputation for making amazing high-quality games that are super stable. The titles on Eclipse Casino website are divided into several categories of slots, table games, video poker and specialties. Their fairness of play is guaranteed through the use of a Random Number Generator. The overall number of games available might not be that huge, but the players can be certain they are dealing with only the best titles from a great game developer. Slots make up the majority of Eclipse Casino game selection, which is perhaps not surprising. You can play classic 3 reel slots, video slots and innovative I-Slots at Eclipse Casino. The latter are Interactive Slots that have a progressing storyline which depends on your choices within the game. There are also a variety of progressive slots available, including the players’ all-time favorite Major Moolah. Having a variety of table games is not less important than having a wide range of slots on the website. Eclipse Casino caters both to players who love spinning the reels and those who prefer to gamble in other ways. The selection of table games on the website might not seem huge, but there is certainly something for even the most seasoned player. Here you can play Blackjack, Baccarat, Roulette and Craps in addition to variants of Poker. There are also a few types of Video Poker at Eclipse Casino for those who enjoy the game. Finally, you can choose to play Keno or Sudoku on the website. If you are looking for a live dealer online casino with PayPal you better look elsewhere. Unfortunately, Eclipse Casino offers no live dealer games on its website. Since it is still a new kid on the block though, we hope the casino will eventually offer this trendy format to its players. 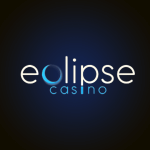 Eclipse Casino website is fully optimized for those who prefer gaming on the move. You can view the website from any screen of any device, including iOS and Android-powered smartphones and tablets. By being mobile-friendly, Eclipse Casino caters to all the clients who would rather gamble on their mobile devices as opposed to computers. The game selection for hand-held devices might be smaller, but this is how it usually is with mobile casinos. Eclipse online casino with PayPal has a variety of reputable banking options that help you move your funds smoothly on and off of the casino. These include Visa, MasterCard, Skrill, Bitcoin, Neteller, PaySafeCard and Wire Transfer. The withdrawal limit is $2,000 per week or $8,000 per month and the casino doesn’t charge you any fees for withdrawal – a welcome departure from most other online casinos. Pending time is about 24-48 hours and withdrawal times are 7-10 days on average. Eclipse Casino takes the security of its clients’ personal information seriously and uses unrivalled data encryption and transmission methods. As we have established, Eclipse Casino is powered by a well-known, trusted operator (Blue Media) and its software platform, Rival, is one of the best in the industry. After being thoroughly reviewed by Casino Guru, Eclipse Casino has gained a Good Reputation Rating (7.0 out of 10). There are no complaints about this casino in the database and it is recommended as a good place to play at. On Ask Gamblers the casino has gained a rating of 7.3 out of 10 and was praised for its variety of games and SSL encryption. Eclipse Casino also has a 24/7 customer support department, which can be addressed via live chat, toll-free number or e-mail. While this is still a fairly new online casino AU PayPal, it has already proved to be a fun and reliable place to gamble. Eclipse Casino has done a better job in just a few years than some other casinos that have been in operation for decades. We are almost certain you will enjoy it!